Call sales for closeout pricing!! 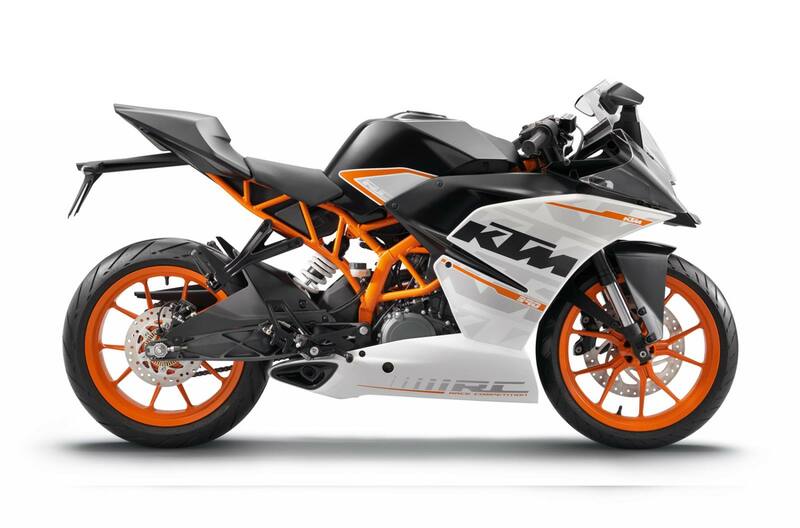 Frame - Solid Technology: Visually similar to the lightweight and approved Duke steel trellis frame, the orange painted frame has been modified to better fit the supersport ergonomics and dynamics. The increase of the steering head angle to 66,5 degrees results in a shorter trail, shorter wheelbase and increased ground clearance. All these modifications release the complete racing potential of the RC and guarantee quick, agile and playful handling. Swing Arm: The light alloy swingarm with directly linked WP shock absorber excels by providing extreme torsional stiffness and outstanding tracking stability. Engine - Racing DNA: The state-of-the-art, liquid cooled, single-cylinder four-stroke 375ccm engine with twin overhead camshafts, four valves and electronic fuel injection, already equipped in the Duke 390 provides outstanding power and thanks to the balancer shaft, delivers the highest level of smoothness. Because of the KTM-typical compact design with stacked transmission shafts the engine has an unbelievable low weight of 36kg. Combine that with technical details like a forged piston, Nikasil-cylinder-coating and forced feed lubrication with power-promoting body-evacuation and you get an engine which provides a remarkable 44hp. The engine is equipped with an electric starter powered by a 12V/6Ah battery. Bodywork - Outstanding Style: The brand new bodywork, footrests and pedals not only provide a unique supersport look but also help the RC to master extreme cornering by allowing a greater leaning angle. Headlight: Brand new twin headlight opens a new direction for KTM style and perfectly matches with the racing supersport look of the RC. 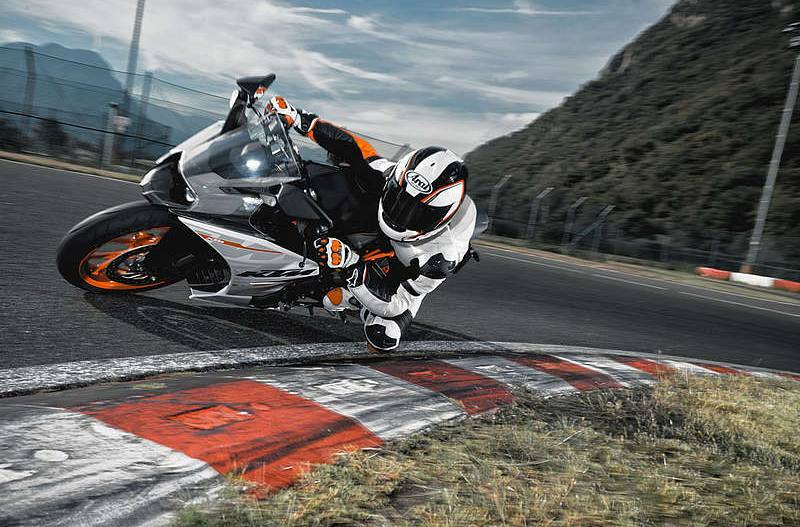 Standard ABS - Safety: ABS is equipped as standard on every RC 390, ensuring maximum safe on any road condition. When taking the RC to the racetrack ABS is of course disengageable. Silencer: The compact underbelly, three-chamber silencer is positioned close to the bike's overall centre of gravity. This aids the centralization of mass and prevents accidental contact with the rider's and passenger's legs. Seat - Ergonomics: The two-part seat offers first class supersport ergonomics with perfect support for rider and pillion. With a seat height of 820mm it enables the rider to have a secure stance whilst also being high enough for sporty use and real big-bike feeling. Windshield: The advanced design wind shield in combination with the aerodynamic optimized motorcycle front ensure incredible wind protection for rider’s chest and arms.